All signs point to a maturing ICO market: fundraising grows more competitive, more established companies wade in, and security tokens show their first signs of life. For the first time, Singapore hosted more ICOs than the U.S.
How much has really been raised by ICOs so far? Most token sale statistics available online rely strictly on third-party reported amounts, which may be outdated and in most cases will exclude projects that do not report their fundraising. There is no consensus among them as the numbers vary between $14 billion and $21 billion as of August 2018. Paradoxically, accurate information about fundraising occurring on the most open, transparent database in the world remains stubbornly difficult to find. Although blockchains are technically transparent, they are functionally opaque. Elementus collects, organizes and analyzes data directly from the blockchain. Our technology enables us to read the Ethereum transaction ledger like an open book. By identifying the various wallets controlled by ICO projects, we may then calculate their total fundraising amounts. In total, we estimate ICOs have raised a combined $28.4 billion as of the end of August, 2018. While investor appetite for tokens has fallen significantly from its peak last February, the picture is not nearly as bleak as the market collapse many are reporting. In August, ICOs raised nearly $1.5 billion, on par with the amount raised during the bull markets of last November. 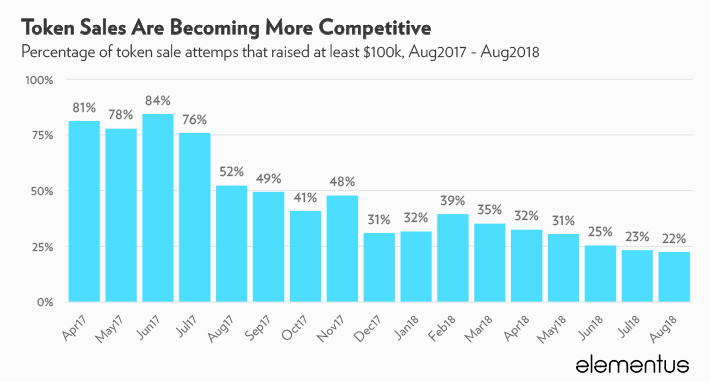 In fact, the majority of historical ICO fundraising occurred during the current bear market. Of the total $28 billion raised to date, $15.9 billion occurred between February, 2018 and August, 2018. 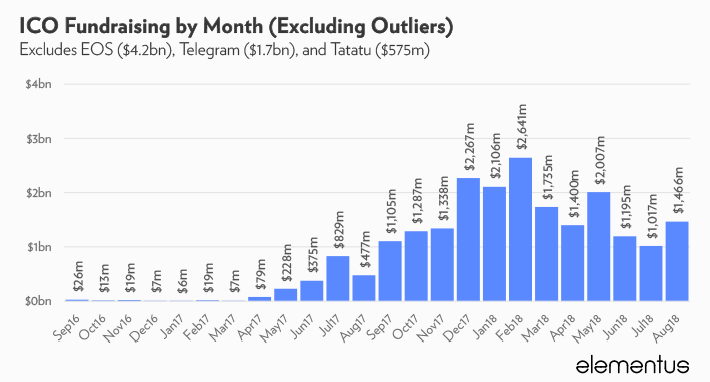 Furthermore, much of the sharp rise-and-fall trend exhibited in the chart above can be attributed to just three ICOs — EOS ($4.2bn, Jun17-Jun18), Telegram ($1.7bn, Feb18-Mar18), and Tatatu ($575m, Jun18). With these outliers removed, the picture looks reasonably stable, particularly given the wild fluctuations seen in the crypto markets over the same period. 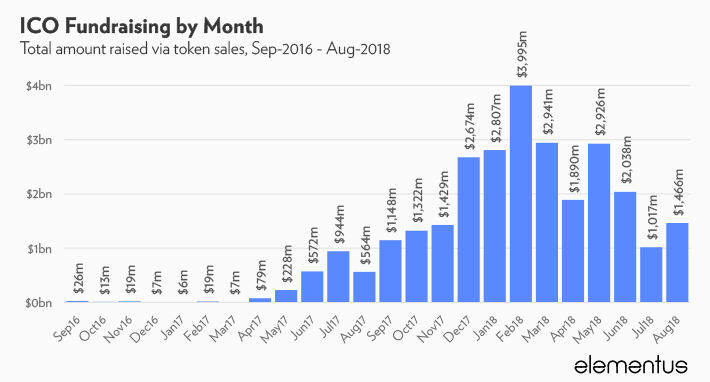 The chart below shows the number of token sales by month. As we have discussed before, we view this metric as a more accurate gauge of ICO market activity, as it is less susceptible to idiosyncratic fluctuations. Consistent with the chart above, this measure also points to a more stable, healthy market. One could argue that overall investor appetite for ICOs has remained strong during this bear market. Of course, once on exchanges, the tokens prices are still at the mercy of the traders. 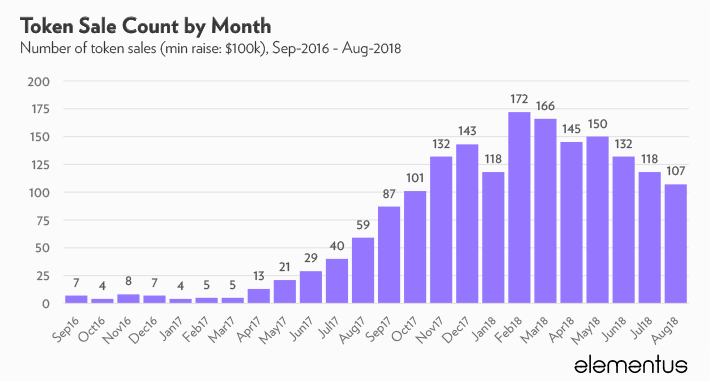 The rate of successful ICOs (above $100k raised) has dropped from one-half to one-fifth over the last 12 months. It seems that investors, whether retail or professional, are growing more selective when giving money to ICO teams. Another sign of market maturity, it is becoming increasingly rare to see pre-product startups complete a $100m+ ICO based on a white paper. The biggest ICOs are increasingly conducted by established companies. Examples from August include London Football Exchange, tZero and Dfinity. Of particular note, tZero’s token sale represents the first security token offering to raise over $100 million. Security tokens have long been hyped as the future of the token fundraising, but successful examples are few and far between. tZero is an important landmark that demonstrates security tokens are capable of garnering strong interest from investors. In terms of location, ICOs are still a global phenomenon. The most striking geographic trends in recent months are a shift away from the U.S., ostensibly due to increased regulatory scrutiny, and a shift toward Singapore. 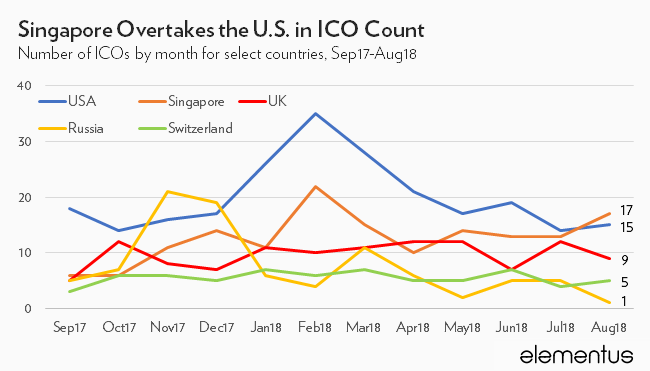 August was the first month in which Singapore hosted more ICOs than the U.S. The figures above were sourced via the Elementus Protocol, an expert system that extracts and interprets transaction data directly from the blockchain. Fundraising amounts were converted into USD at the prevailing cryptocurrency exchange rate at the time the sale closed. Contributions to the EOS ICO, which has been ongoing since June, 2017, were converted daily at the ETH-USD exchange rate. Funds raised through token-convertible securities were sourced from SEC filings. Project location countries are self reported, compiled primarily from social media profiles.